I just returned from attending the 7th Anuga FoodTec in Cologne, Germany. 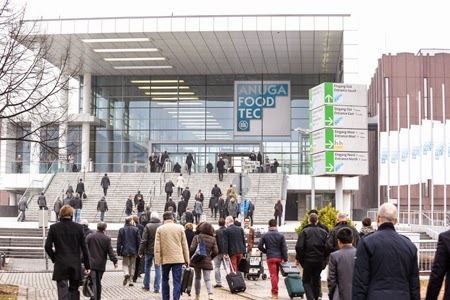 Also known simply as AFT, this expo is not to be confused with Anuga, the world’s largest finished food fair taking place later this year (October 10 to 14) in the same location. The AFT is held every three years. It is the only trade fair in the world that covers all aspects of food production. Five exhibition segments of AFT--Food Processing, Food Packaging, Food Safety, Ingredients (new for 2015) and Services/Solutions--form one transparent information system for all areas of the industry and for all levels of resources. For the industry visitor, AFT encompasses all the synergies of a process-orientated production chain, from raw material to delivery-ready end product. The expo ends today, March 27, and final numbers are expected to show that more than 43,000 highly qualified trade visitors traveled from around 130 countries to view the more than 1,500 supplier exhibitors representing 49 countries. Both the dairy and meat industries showed the most growth in terms of exhibitor numbers and space, as compared to the 2012 expo. To read some highlights from the dairy sector, as reported by Koelnmesse, a co-organizer of the event, link HERE. As an attendee of many, many trade shows, I am exposed to a lot of innovation. The AFT was no exception; however, there were definitely some innovations that stood out. Here are two of them. 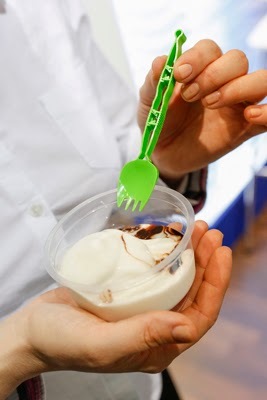 This gadget from the German packaging company Poppelmann GmbH & Co., takes the foon (fork plus spoon), also sometimes called spork (spoon plus fork), to a new level, as it has a foldable design so that it fits into the dome of a single-serve cup container. When removed, the consumer straightens it, snapping together the two halves of the handle to form a foon that is 125 millimeters long. It is also stable and long enough to reach the bottom of the container without effort and without getting hands dirty. 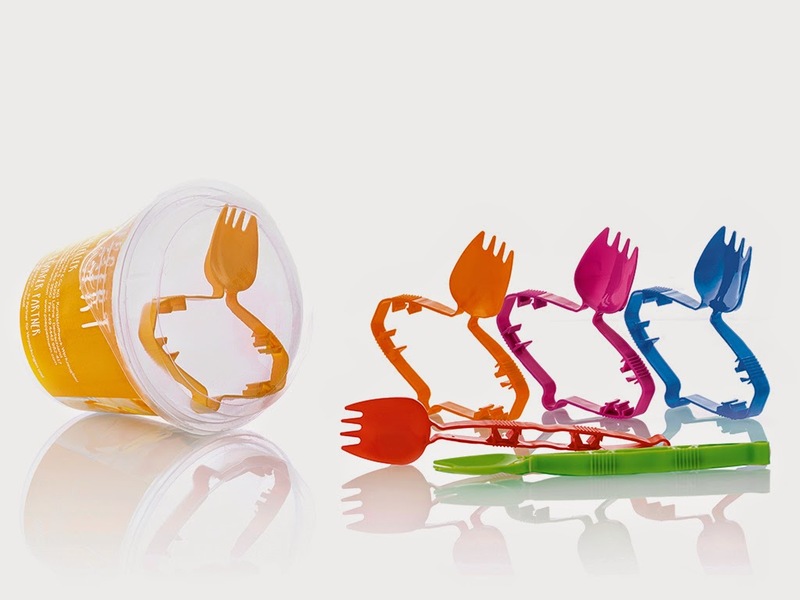 The company supplies the cup, the dome and the foon, but the pieces are available individually, too. This type of container is ideal for high-protein dairy foods such as cottage cheese (with delicious inclusions), yogurt blended with grains such as chia, oats and quinoa, and desserts such as rice pudding and quark. To read more about the foon, link HERE. The foon recently won a German Packaging Award. Read more HERE. 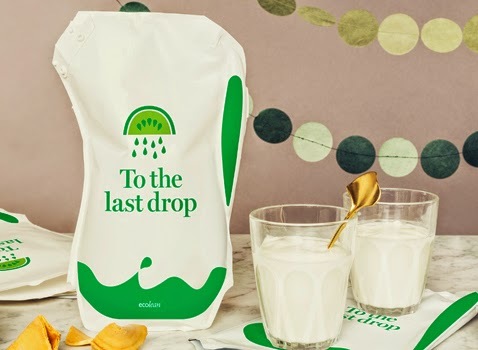 The second show stopper for me comes from Ecolean, a Swedish aseptic filling and packaging company that markets a uniquely shaped stand-up plastic pouch for refrigerated and shelf-stable beverages, including milk and drinkable yogurt. During AFT, the company sponsored a seminar entitled “Packaging innovation and brand regeneration,” and showed attendees through customer testimonials how the stand-up pouch can help a dairy increase sales of fluid milk. 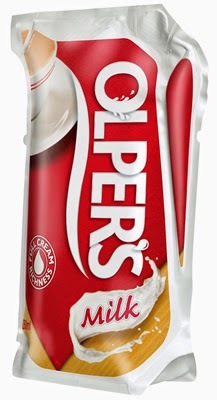 “We have been able to double the sales of the brand since the launch of the Ecolean package and this can be attributed to the new innovative package format,” said Syed Waqas Azhar, general marketing-dairy, Engro Foods Ltd., Pakistan, marketers of the Olper's brand of milk. The flexible stand-up package is shaped like a pitcher. It has an air-filled handle that adds to the stability of the package, as well as makes it convenient for pouring. It comes in varied sizes, from single serve to family size. It can be colored or clear, and even have an attached straw. The flexible packaging has a well-suited surface for high-quality print, which together with a generous primary display panel, functions as a billboard to get the attention of today’s fast-paced consumer. To read more about the package, link HERE. Now here’s the yummy product concept. Whenever and wherever I travel, I make supermarket visits. Germany always has some of the most innovative dairy products, and this one is definitely new, as I did not see it the last time I visited the country in October 2013 for Anuga. It’s a cream cheese- and butter-based bread spread with large and plentiful flavorful inclusions. It is designed to be spread on bread or a baguette and then baked in the oven or toaster oven for about 8 minutes. The spread bubbles and firms up on the bread, which simultaneously gets toasted. 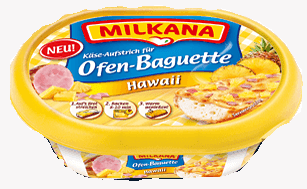 Edelweiss is rolling out three varieties under its Milkana brand. There’s Hawaii, (ham and pineapple), Salami and Tarte. This TV commercial—there’s two, and it’s the second one—shows you exactly how the spread bakes up. Watch it HERE. I purchased the Hochland Tarte product and did not have an oven handy. 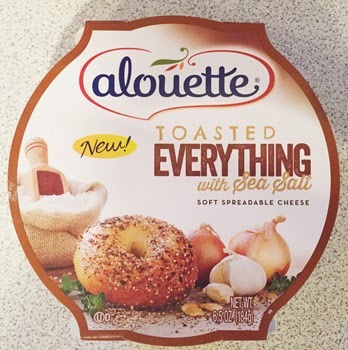 But I spread it on some bread and it was super delicious even chilled. I would really love this product in America. Hint, hint. There will not be a blog next Friday, April 3rd, in respect for Good Friday. Have a lovely Easter and Passover holiday, and for many, a sunny and warm spring break. Watch out Key Largo, the Berry’s will arrive soon! Millennials Like Good Food. They Will Try Everything. A Groupon email yesterday had this subject line: Eating—It’s the Fad Sweeping the Nation! I could not agree more. For many, eating today is more about the experience than sustenance. This is being driven by Millennials, who are more than a demographic. Being a Millennial is actually a state of mind. Pew Research Center developed a 14-item quiz to determine how Millennial you are on a scale from 0 to 100. You can access it HERE. Yesterday was also the first day of the 11th annual Good Food Festival & Conference in Chicago. I was fortunate to attend some sessions and met and heard some movers and shakers in the Good Food movement. 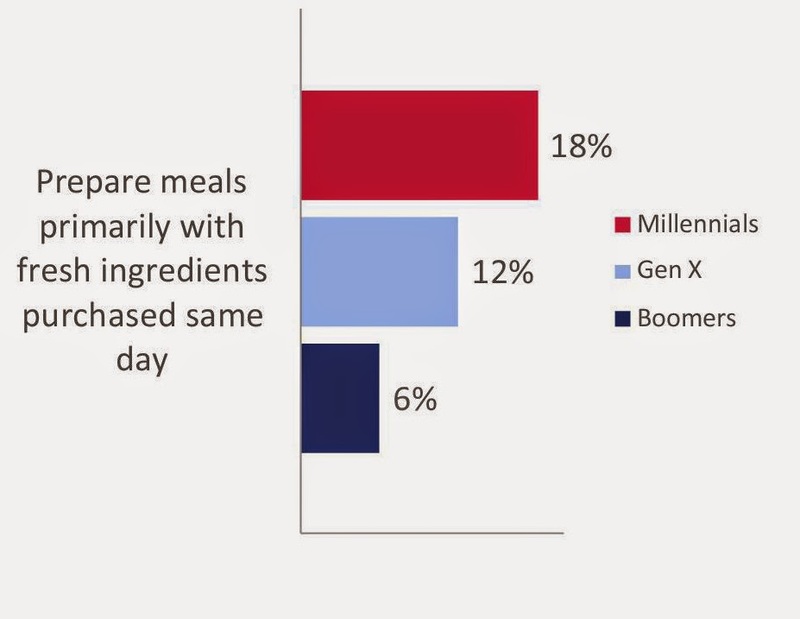 By the end of the day, it became very clear, Good Food is what Millennials want. The words natural, organic and GMO never came up during an incredibly moving speech by Chef Rick Bayless. Rather he emphasized local agriculture and deliciousness. Bayless opened his first restaurant, Frontera Grill, in Chicago, 28 years ago today, and since has been a major influencer of changing the way chefs procure produce, meat and other ingredients in The Windy City. And, as he pointed out, at O’Hare airport, where Frontera operates a quick-serve restaurant run on the same principles as his downtown sit-down establishments. He said he knew early on the only way he was going to succeed in the highly competitive Chicago restaurant scene was if he served up a plate of deliciousness. This was only going to be possible by sourcing the freshest ingredients, which, of course, is not the easiest thing to do in the Midwest. But he found a way, and today that way has become the Rick Bayless Farmer Foundation, a very impressive program designed to support local farmers. To read more about it, link HERE. This was the first time I had heard of it, and I remain in awe. 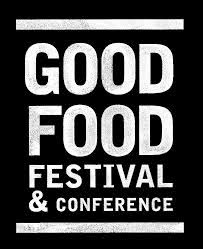 To read more about the Good Food Festival & Conference, link HERE. What became apparent to me at the conference is that yes, organic, natural and non-GMO are important to a fast-rising number of people—the Millennials—but at the same time, if you are buying good food, consumers trust that these foods are made as organic, as natural and as free of GMOs as possible. After Bayless spoke, there was a panel discussion featuring Good Food business success stories. Julie Smolyansky, CEO of Lifeway Foods, along with three other entrepreneurial leaders spoke about their early beginnings and how they became the success they are today. 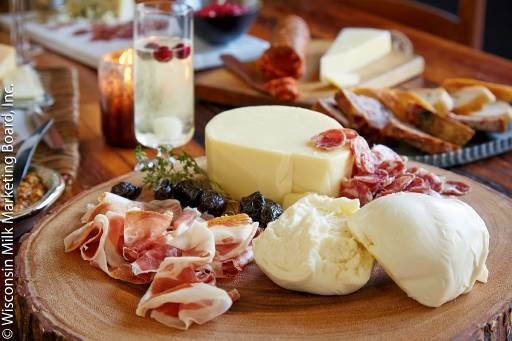 The unified theme was simply doing the best possible to offer consumers the best good food, along with investing in the communication of this goodness. Let’s face it. Gone are the days of families eating frozen TV dinners. (Remember those metal trays? If you were lucky, you got one with dessert…some scary chocolate mush.) Though I occasionally crave my mom’s quick Friday Lenten fix…Kraft mac and cheese mixed with canned tuna and canned peas…it is highly doubtful Millennials have ever tasted or ever will taste what once a staple meal for many. There’s no doubt that changing American demographics and the evolving food culture are affecting how we live, shop and eat. The good news for the dairy industry is that we produce some pretty darn good food. It’s a good time to be in dairy…but it is critical that you understand how to communicate your products’ goodness to consumers. IDDBA’s latest study, “Engaging the Evolving Shopper: Serving the New American Appetite,” concurs that Millennial shoppers are at the forefront of the “New American Appetite.” From this study, conducted by The Hartman Group Inc., IDDBA has developed an on-demand webinar entitled “Tapping the Momentum of Millenials in Fresh Perimeter Categories.” This includes dairy. You can view the webinar HERE. 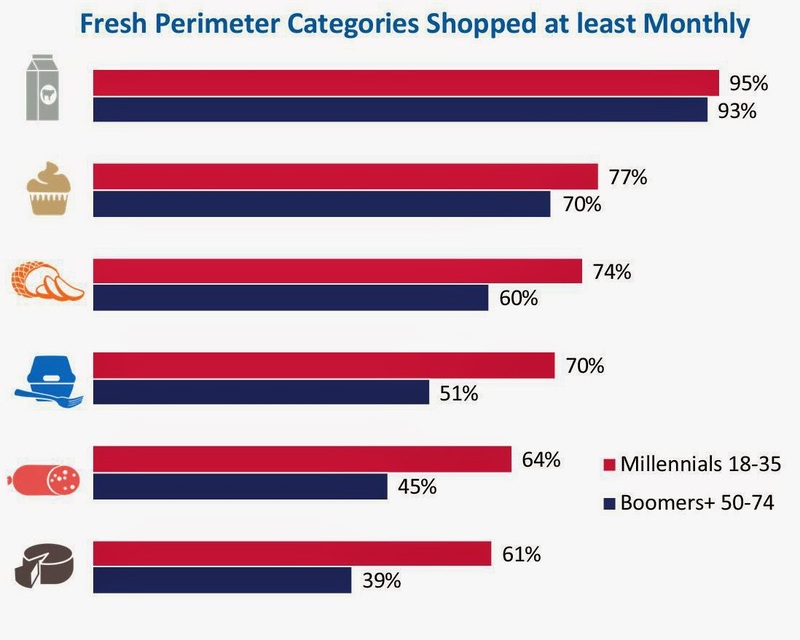 The Hartman Group’s research shows that Millennials engage with fresh perimeter categories differently than Boomers. Millennials use the fresh parameter both as a healthy source for ready-to-eat meals and snacks, and for fresh ingredients to cook. Dairy marketers are smart to offer more convenience options. Millennials shop more frequently. They want fresh ingredients purchased the same day. Dairy marketers are smart to offer smaller sizes of products for one-time use. Millennials will try everything. They think in terms of ethnic cuisines, sometimes even regional specificity. 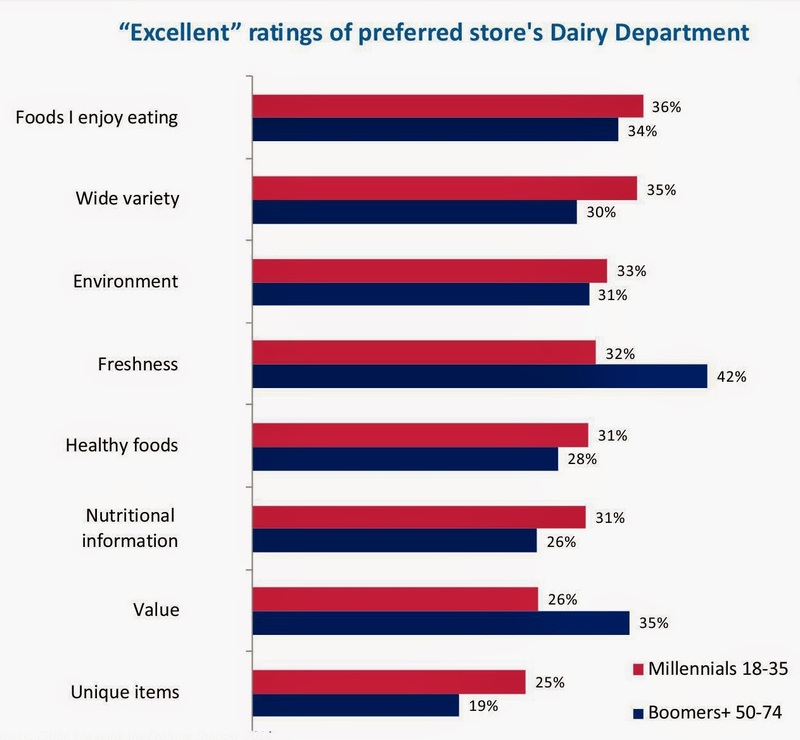 Selection and wide variety in the dairy department resonates with Millennial shoppers. They want good food. They want more local food. This is an easy one for dairy! The 35th annual Natural Products Expo West took place less than a week ago in Anaheim, CA. And what an amazing Expo it was! As the world’s largest natural, organic and healthy products event, Expo serves as a reunion for many of the industry’s original players. I was not there in the beginning, but I do remember the early days…like the one “clothing optional, fig leave acceptable” year. Not sure what year was my first, but I do remember there were only three dairies with booths larger than a tabletop. They were Stonyfield Farm, where Gary worked the booth in jeans and Birkenstocks; Organic Valley, which was then still referred to as CROPP, where George, in his predictable jeans and flannel shirt, was advocating for national organic standards; and Horizon, still owned by its founding fathers, Mark and Paul, was the newbie in the trio, and had grand plans in place to make organic milk available nationally. Congrats to all three and the many, many more dairy companies selling everything from cheese to ice cream to kefir to yogurt. You all shined at this year’s Expo. This past week, the Daily Dose of Dairy began featuring new products that debuted at the show. This will continue, most likely, for the next month, as there were so many innovations. Below is a sneak peak of what’s to come. But first, some general show highlights. The 2015 event grew 7.2% from the previous year, bringing together more than 71,000 industry members, more than 2,700 exhibiting companies and 634 first-time exhibitors. These are some of the macro trends influencing the marketplace. Transparency: Consumers are increasingly demanding to know what is in their food, and brands are responding by using technology and other innovations to provide greater transparency and traceability for their products. Ancient Wisdom Gets Wiser: Brands continue to innovate by producing simple, delicious products that take minimal processing to new levels and contain short lists of nutrient-dense ingredients. Many companies were recognized with awards at Natural Products Expo West, including one dairy product. Noosa Yoghurt LLC’s Vanilla Yoghurt was a runner up in the “Best of West: Press Award.” Congrats! 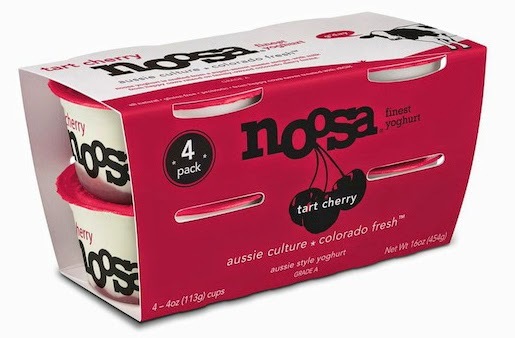 Noosa is a whole milk yogurt described as Aussie style. It is made using fresh Colorado milk at the family-owned Morning Fresh Dairy in Bellvue, Colorado. Noosa partners with Colorado-based Beyond the Hive to lightly sweeten its yogurt with golden Clover Alfalfa honey. Most recently the company began offering its two most popular flavors—Blueberry and Tart Cherry--in four packs of 4-ounce cups. Each 4-ounce cup contains 140 calories, 5.5 grams of fat, 14 grams of sugar (including milk’s inherent sugar) and 7 grams of protein. The convenient on-the-go cups join the 8- and 16-ounce containers. As mentioned, both dairy products and dairy alternatives were trending at Expo. Dairy processors should be aware of the competition, and that includes manufacturers and marketers of dairy alternatives. To read an overview of the dairy alternatives category and view product examples in a slideshow, link HERE to an article I wrote for Food Business News this week. Something I point out in the article is that some of these alternatives rely on ingredients that you would not find in grandma’s pantry, which contradicts the clean-label trend. Dairy processors are fortunate to be starting with a highly functional and all-natural base material—cows milk—and have many clean-label ingredients readily available to them in order to provide health- and wellness-seeking consumers with products close to what Mother Nature intended. To read more about formulating clean-label yogurt and other dairy products, link HERE. Here are some product highlights from Expo. Remember to watch for more as a Daily Dose of Dairy the next couple weeks. 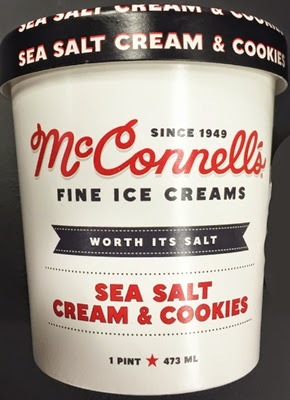 McConnell’s showed attendees that sea salt goes with more than caramel. Handcrafted in Santa Barbara, CA, Sea Salt Cream & Cookies Ice Cream starts with a base of dense, velvety smooth and creamy sweet cream ice cream. This gets layered with a hint of local sea salt and bountiful bits of chewy, house-made, Guittard chocolate chunk cookies. 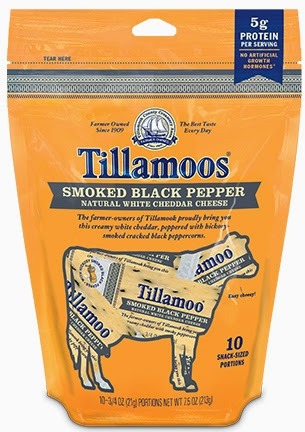 Both Tillamook and Organic Valley rolled out cheese sticks designed for adult snacking. Organic Valley’s packages state “made with milk from our pasture-raised cows.” In addition to sporting the USDA Organic seal, the company wants to make sure consumers understand that “organic is always non GMO” and that it never uses “antibiotics, synthetic hormones, toxic pesticides or GMOs” and states so on the package. 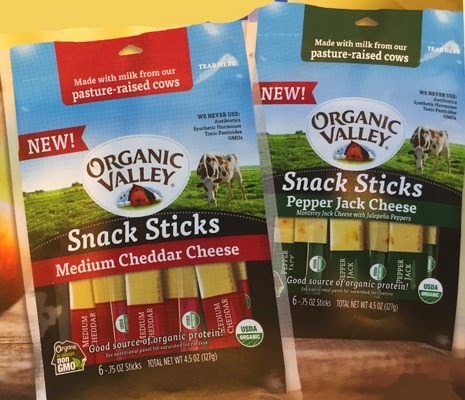 Organic Valley’s (0.75-ounce) sticks come in Medium Cheddar and Pepper Jack varieties. They are sold in bags of six. 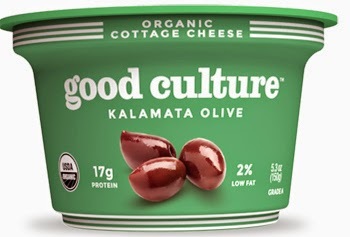 The good culture company used Expo to officially launch its namesake line of sweet and savory single-serve organic cottage cheese cups. The initial rollout includes five varieties: Blueberry Açaí Chia, Classic, Kalamata Olive, Strawberry Chia and Sundried Tomato. The single-serve containers come in convenient, on-the-go 5.3-ounce packs. For more info link HERE. 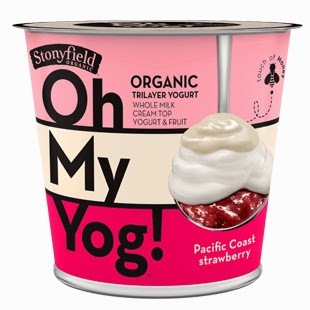 Stonyfield also used Expo West as its official launching pad for Oh My Yog! This tri-layer yogurt made its soft launch at the Fancy Food Show in January and has started rolling out to the retail marketplace. The top layer is cream, the middle layer is honey-sweetened whole milk yogurt and the bottom is flavorful fruit, or in the case of the Madagascar Vanilla Bean variety, vanilla-infused yogurt. The fruit varieties are: Apple Cinnamon, Gingered Pear, Orange Cranberry, Pacific Coast Strawberry and Wild Quebec Blueberry. Each 6-ounce cup contains 190 calories, 5 grams of fat and 7 grams of protein. For more information, link HERE. WhiteWave Foods showcased many innovations, for both the refrigerated and ambient dairy cases, as well as grocery. Let’s focus on dairy. 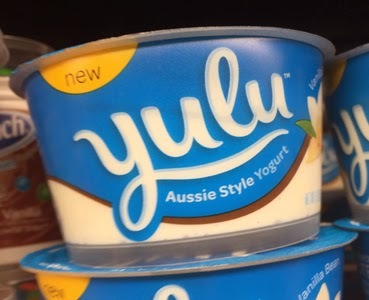 The company made its official industry debut of yulu Aussie Style Yogurt at Expo, which Daily Dose of Dairy was first to write about in February. 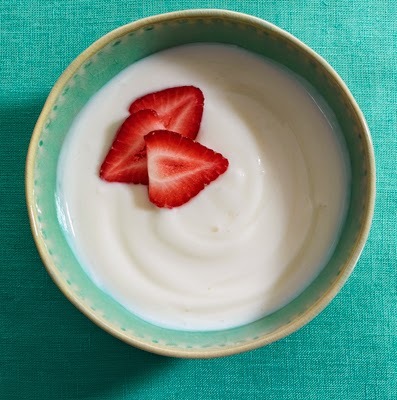 This is an Australian-style yogurt, which is known for its velvety texture and creaminess as well as inclusion of large, identifiable pieces of fruit. For more information, link HERE. 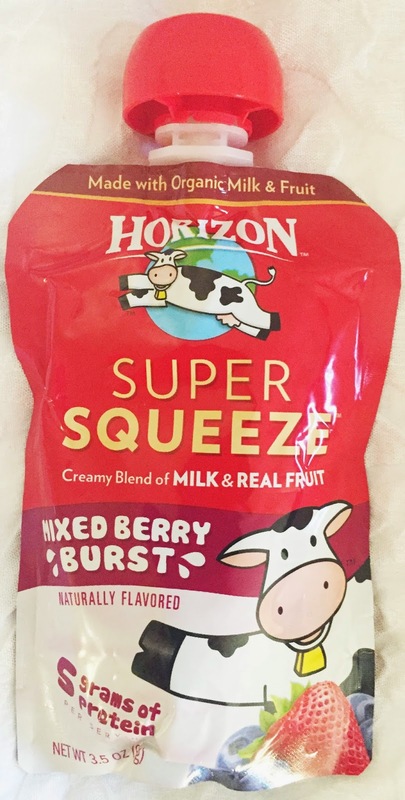 Under the company’s Horizon label, is an industry first in the U.S. New Super Squeeze is shelf-stable pouches of milk and real fruit. The highly viscous product is made with organic milk and organic fruit purees, with each pouch containing 100 calories, 5 grams of protein, 15 grams of sugar, 2 grams of fiber and no fat. For more info, link HERE. My friends at Lifeway Foods have been very busy this year. In case you missed this week’s Daily Dose of Dairy on the company’s new Lifeway Protein Kefir, a line extension designed to aid in muscle recovery after exercise, you can read about it HERE. Other innovations from the company include Lifeway Pretty Plain ProBugs. 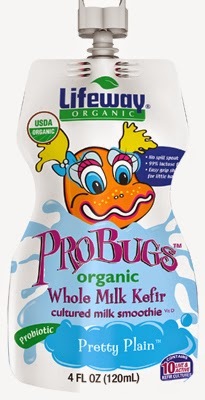 It’s the first no-sugar-added flavor in Lifeway’s popular line of organic whole milk kefir smoothies designed for younger children, and it comes in the same fun 4-ounce sippy pouch as the rest of the ProBugs family. That means an easy grip for little hands along with a no-spill spout--exclusive to Lifeway--that makes it car-safe. Personified on the package by a cartoon bug character named Pretty Plain Pearl who “likes her life clean,” the new product joins ProBugs’ Sublime Slime Lime, Orange Creamy Crawler, Goo Berry Pie, Strawnana Split and Kiwi Kale Critter varieties, each with its own giggle-inducing persona to keep kids entertained. Also new for this summer is Lifeway Lowfat Watermelon Kefir. Scheduled to hit store shelves in June, this summertime special is lightly sweetened with only 8 grams of additional sugar and has just 20 fat calories in each 140-calorie serving. It’s also 99% lactose-free, gluten-free and all-natural with 12 live and active probiotic cultures, 11 grams of protein and 30% of your daily recommended calcium, plus the natural watermelon flavor everyone loves. No melon carving needed! The folks over Smari Organics have also been super busy and are growing their line of refrigerated Icelandic namesake yogurts. Smari yogurt debuted about two years ago and was written about first by Daily Dose of Dairy HERE. Smari yogurt is made with milk from grass-fed Jersey and Guernsey cows, with each 6-ounce cup delivering 20 grams of protein. The original line is four fat-free options: Blueberry, Pure, Strawberry and Vanilla. Now the line includes fat-free Peach, Pure Whole Milk, Vanilla Whole Milk and low-fat Coconut. Mark your calendars for Natural Products Expo East 2015, which will return to the Baltimore Convention Center, September 16 to 19, 2015, in Baltimore, MD. For more info, link HERE. Natural Products Expo West 2016 is scheduled to take place March 11 to 13, 2016, at the Anaheim Convention Center in Anaheim, CA. Details will be available later in the year. 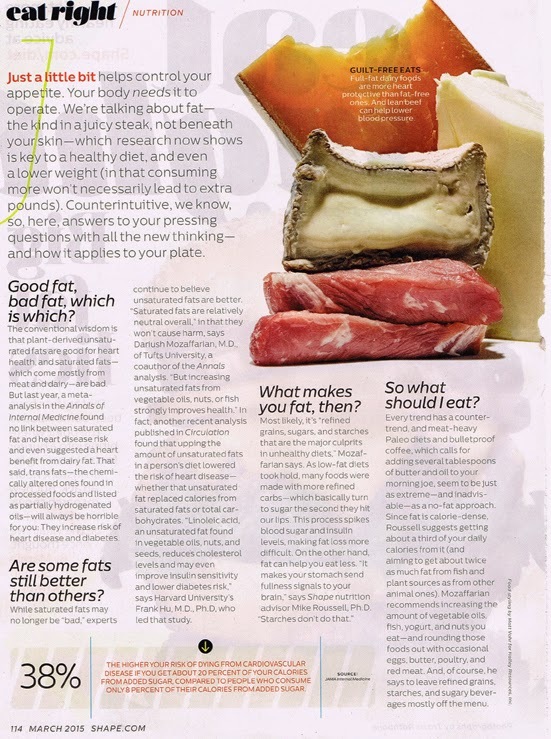 Dairy Foods Make Headlines…and More! I needed a travel/mental health day to get to and get in the mindset for Expo West/Engredion in Anaheim. Not to disappoint….here are a few items for your reading enjoyment. For starters, if you are involved in the development, marketing or distribution of ice cream, please plan to attend the Ice Cream Technology Conference March 31 to April 1 in St. Petersburg, FL. For more info, link HERE. If you are involved in cottage cheese or other cultured dairy products, as well as fluid milk and milk beverages, you should plan to attend the Milk and Cultured Dairy Products Conference May 19 to 20 in Minneapolis. For more info, link HERE. Back to Expo West/Engredion. My Friday plans are to start in the early-morning hall (9:00am sharp at the Hilton) and walk up and down every aisle until I end the day at Engredion (Hall A). Hope to see many of you there. Please shoot me an email HERE with your booth number and what time you will be there, and I will make an effort to visit. Think 9:00 Hilton, about 9:45 Arena, 10:30 Hall E (lower level), 11:15 Next Pavilion, noon Hall D, 1:00 Hall C, 2:00 Hall B, 3:00 (to the Marriott for State of the Industry symposium), 4:15 Hall A. Aggressive schedule! I know, hence no blog. My apologies. P.S. Don’t forget to move your clocks ahead Saturday night. Spring is almost here!